I AM AWAITING NEWS ABOUT THE EXPLOSION in downtown Bozeman. I can see the thick column of smoke rising straight up over the empty day care center across the street from my house announcing that something has happened. But I cannot find out what because the newspaper has already been delivered. I am waiting for news about the explosion in downtown Whitehall. I hear someone say in the hallway outside my office on the Montana State University campus there had been an earthquake at 4:10 a.m. centered somewhere near Whitehall and maybe that is the cause. But I cannot find out how serious the damage has been because there is no story about it in my morning paper. IN MY FREE MOMENTS I scan the news websites. 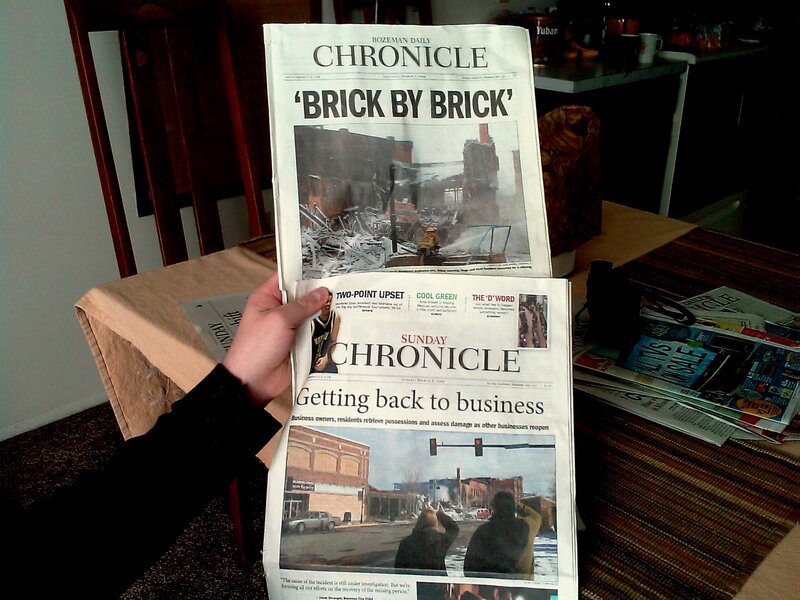 The Bozeman Chronicle doesn’t update very much and then with scant new bits of information. The Billings Gazette yawns a bit because this is happening to someone else 140 miles away. The Montana Standard, in Butte, seems to update their online site less often than the newspaper itself. Radio? Nope. TV. Nope? Old news. What in God’s name happened to that poor woman who disappeared? Wendy goes to The Academy of Cosmetology on Mendenhall Street for her seven dollar haircut in downtown Bozeman on Saturday and learns a number of things. One of them is that the remains of the still unnamed missing woman have been found across the street from the blaze. This seems most gruesome and I begin scanning my sources, even trying to resurrect a Twitter account I had opened long ago and abandoned because it didn’t make any damned sense to me (being not under 40 years of age). There is nothing. When the newspaper plops on my doorstep Sunday morning I brush the snow off of the plastic bag and pop the paper out of the rubber band (seems a bit extravagant to have a rubber band AND a plastic bag) and the news is … the missing lady is still missing. All resources are focused on finding her. Fire suppression still going on. The news from Whitehall is not as grim but still involves at least four historic buildings in the center of town going up in smoke. There is a bit of speculation now about the relationship between earthquake and gas explosion. When a story does finally appear in The Chronicle I can feel the collective yawn coming from the staff. Whitehall is 60.1 miles away from the Academy of Cosmetology representing a strain on the editorial resources of the Chronicle. Hardly something of interest to readers in Bozeman caught up in the biggest story of the century. They can let the Montana Standard cover it being just the other side of Homestake Pass. That is, if the Standard can find anything located on the east side of the Continental Divide. I WANT TO GRAB the nearest editor I can find (of course I know nearly all of them since I studied journalism in Montana, uh, about 30 years ago) and shout … DOES THE FACT THAT TWO DOWNTOWNS OF TWO CITIES A MERE 60 MILES APART HAVE HAD TWO DISASTEROUS FIRES CAUSED BY GAS EXPLOSIONS WITHIN A DAY OF EACH OTHER IN ANY WAY SPARK A BIT OF CURIOSITY? But these guys are my friends and I can’t say anything so rude to them. The Whitehall story has disappeared from my newspaper today. Coverage of the Bozeman debacle is shrinking rapidly. In Billings the hot story is the rescue of Duke the St. Bernard after two days being stranded on a frozen lake. Humans rescuing a St. Bernard … GET IT? Not dog bites man but man saves DOG? My sister, who lives in Ontario, can find photos of the Bozeman mess on CNN. Looking back I may have been very wise to simply get into my car and drive in the direction of the column of smoke so that I can SEE with my actual eyes much of what is happening. I learn that one of my work colleagues is standing on a street corner a quarter block away from the explosion and she can describe the loud boom and how she is still a bit shaken. Ron the special education consultant calls the teacher in Wendy’s classroom in Gallatin Gateway to say he’s OK, has been evacuated from his office, the flames are still shooting up into the air and he’s afraid there is loss of life judging by the size of the explosion. The teacher then has to call her spouse whose office is in the bank directly across the street from the blast to make sure he is OK.
IT’S DAWNING ON ME that I should simply send my son down to the Academy of Cosmetology with a note pad (he always needs a haircut anyway) and he can bring back firsthand reports of the latest rumors. The truth is hardest to accept. There just ain’t a lot of media here. Not a lot of news. And when there IS a lot of news, the pipeline for getting it to me is like a drip, drip, drip and I have my mouth positioned to catch every splash. This entry was posted on Sunday, March 8th, 2009 at 1:18 pm	and is filed under Bozeman, ESSAY. You can follow any comments to this entry through the RSS 2.0 feed. You can leave a comment, or trackback from your own site. I have always wodenred why there wasn’t much going on in Portland, and I am so glad God has chosen you guys to work there. So many students, so much potential to impact the city (and beyond) for Christ! I know a Grandma and Grandpa who will be happy you guys are closer! Bless you. Praying for you. Dr. Brin, you need to study WHY the electoral college exists. The founders of this nation understood that there are two kinds of majority — the majority of the people, and the majority of the states. The electoral college was created to ensure that a majority of the people (which with current demographics could mean the populations of California and a handful of North-eastern states) do not get to run the country for the rest of us. It means that the successful presidential candidate has to appleal to the majority of the states as much as to the majority of the people. Find another way to stike that mathematical ballance, and I will listen.